IBM Scientists have got success in creating world's smallest 3D map in nanoscale. The 3D map is so small that 1000 maps can fit on a grain of salt! A team of scientists at IBM Zurich achieved this through new technique by use of silicon tip with a sharp apex ( about 100,000 times smaller than a tip of a pencil) to create patterns and structures in nanoscale. This nanopatterning technique in future will be used for creating a nanosized object for chips, electronics, optoelectronics, medical etc reducing cost. A 25-nanometer-high 3D replica of the Matterhorn, a famous Alpine mountain that soars 4,478 m (14,692 ft) high, was created in molecular glass, representing a scale of 1:5 billion. 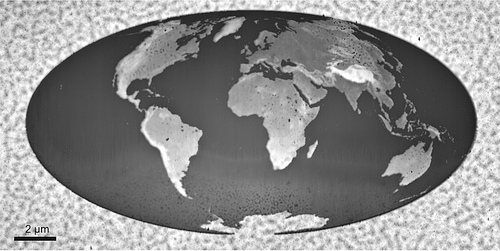 Complete 3D map of the world measuring only 22 by 11 micrometers was written on a polymer. At this size, 1,000 world maps could fit on a grain of salt. In general, one thousand meters of altitude correspond to roughly eight nanometers (nm). It is composed of 500,000 pixels, each measuring 20 nm2, and was created in only 2 minutes and 23 seconds. 2D nano-sized IBM logo was etched 400-nm-deep into silicon, demonstrating the viability of the technique for typical nanofabrication applications. 2D high-resolution 15-nm dense line patterning. The new IBM technique achieves resolutions as high as 15 nanometers with a potential of going even smaller. Using existing e-beam lithography, it is hard to fabricate patterns at resolutions below 30 nanometers, where the technical limitations of that method are reached. 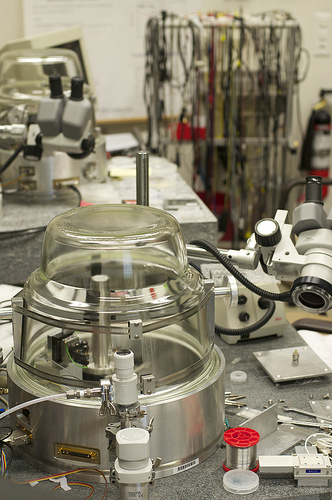 The expensive e-beam-lithography tools require a big laboratory, whereas tool created by IBM scientists can sit on a tabletop (see image). "Advances in nanotechnology are intimately linked to the existence of high-quality methods and tools for producing nanoscale patterns and objects on surfaces," says physicist Dr. Armin Knoll of IBM Research – Zurich. "With its broad functionality and unique 3D patterning capability, this nanotip-based patterning methodology is a powerful tool for generating very small structures." This Nanopatterning will bring advancements in computer and electronics reducing cost and increasing capabilities. What do you say? IBM really making our daily life easy. They are innovative and every now and then they provide something new. A great success for IBM scientists for creating world's smallest 3D map . Thanks , for sharing. Thanks for your comment friends. This makes the computer Giant IBM one of my dream company. Such a small map on a salt. Well truly amazing. Great work. Of course, I am actually exited about nanocomputing.